WASHINGTON (AP) Vince Velasquez got back on track against one of baseball’s best lineups. 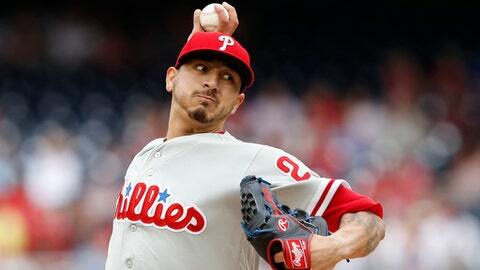 Velasquez pitched five effective innings, Rhys Hoskins hit a two-run homer and the Philadelphia Phillies snapped Washington’s six-game win streak with a 3-1 victory over the Nationals on Saturday. Velasquez (2-4) yielded one run and one hit in his first win since April 7. He had dropped his last three starts, allowing 13 runs and 18 hits in 14 2/3 innings. Velasquez didn’t allow a hit until Wilmer Difo’s homer in the fifth. The right-hander struck out four, walked four and hit a batter. Edubray Ramos, Tommy Hunter, Luis Garcia and Hector Neris then combined for four innings of one-hit relief. Neris earned his sixth save. Washington third baseman Anthony Rendon went 0 for 2 with two walks after missing 19 games with what the team called a contusion to his toe. Andrew Stevenson had Washington’s other hit, a one-out single in the sixth. Pedro Severino followed with a walk, but Ramos induced a double-play grounder from Rafael Bautista. Cesar Hernandez opened the game with a single and Hoskins homered to center on a 3-2 pitch. Maikel Franco provided an insurance run when he followed Carlos Santana’s one-out triple with a single in the sixth. When reporters entered the Nationals clubhouse before the game an eight-piece Mariachi band was performing in honor of Cinco de Mayo. Hoskins homered and walked in the same game for the 12th time in his career. The Phillies are 11-1 in those games. ”He seemed to have more traditional Rhys Hoskins at-bats today with deeper counts, longer at bats, big home run,” Kapler said. Phillies: RHP Ben Lively (lower back strain) threw 20 pitches in a bullpen session. Lively was placed on the disabled list April 27. … Kapler said RHP Pat Neshek (shoulder strain) will throw a bullpen session as the next step in his rehabilitation. Neshek has not appeared in a game this season. Nationals: 1B Ryan Zimmerman was scratched from due to stiffness in his side, according to Martinez. … RHP Trevor Gott, who sprained an ankle in the sixth inning Friday night, is day to day. The winners of the last three NL Cy Young Awards square off when Philadelphia’s Jake Arrieta (3-1, 3.49 ERA) opposes Max Scherzer (6-1, 1.79 ERA) on Sunday. Arrieta won the award in 2015 with the Cubs and Scherzer, the National League Pitcher of the Month for April, has claimed the honor each of the last two seasons.